Tuna is a great source of obtaining phosphorous and vitamin B6. In addition to this it is also terrific in taste therefore people use it as the main ingredient in different dishes, and this includes salads as well. 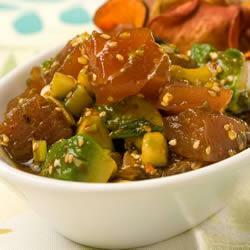 Tuna and Avocado Salad with Sesame Soy Dressing is one such salad which includes this healthy ingredient. Aside from being delicious and beneficial for health, Tuna and Avocado Salad with Sesame Soy Dressing is a great dish to relish during summer dinners. There is no doubt that it will certainly impress your guests, as ingredients like avocado, lemon juice, sesame oil and others really blend well together with tuna. Take a medium sized bowl and combine 350g sushi-grade diced tuna fillets, 60g diced cucumber, 1 peeled, stone removed and diced avocado, 4 chopped spring onions, 1 1/2 teaspoons chilli flakes and 1 tablespoon toasted sesame seeds in it. Then pour 2 teaspoons sesame oil, 1 1/2 teaspoons lemon juice and 125 ml soy sauce in this tuna mixture and carefully stir it until it is blended without mashing avocado. After blending the ingredients place this bowl in a large bowl, which should be filled with ice. Then put this larger bowl in the refrigerator for about 15 minutes to chill and not longer than this. When the tuna mixture is chilled, then take it out of the bowl of ice and transfer it into a serving plate, as it is ready to be consumed.